HJ: Mudras are ‘hand gestures’, which when held for a specified period of time (typically 5-20 minutes), can have profound transformative effects on health and consciousness. They work by activating the various energy lines and meridians located in the hands, which stimulate different areas of the physical and etheric bodies. Mudras are powerful ancient yogic techniques that have been developed and refined over the course of thousands of years by highly advanced swamis, yogis and mystics. They are powerful techniques and should be treated with respect. Start slowly and work your way up to longer lengths of practice. When combined with breathing techniques and visualization, the effects can multiplied by orders of magnitude. Since I was but a child, I would always form intricate patterns with my hands and fingers. I learned later on that many of these forms that I was spontaneously compelled to create were either exact mudras or variations on them incorporating sacred geometric patterns. This was likely soul memory surfacing from past lifetimes. It is amazing what knowledge we are born with but learn to forget or surpress as we grow older. Anyways, speaking from experience, combining these mudras with meditation will help you understand their effects on the mind/body/spirit triad. Picking a mudra, holding it and then quietly meditating and noticing its effects both during and after the meditation can help you to build a roadmap of incredibly powerful hand gestures that can be held throughout the day as needed. Description: Kilakamudra II is often used to indicate the energy of intimacy and has effects related to the endocrine system and the sexual organs, which are intricately related. 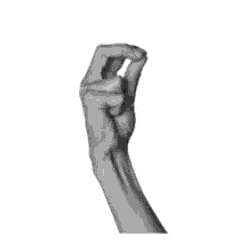 This mudra is often used in the system of Japanese Tantric Buddhism. Technique: Cross the wrists with the hands back to back. Hook the little fingers with the tips pointing upwards. Join the thumb, index, and middle finger on each hand. Extend the ring fingers upward at about a 45-degree angle. Application: In a comfortable seated position, hold the mudra in front of the heart a comfortable distance from the body. Relax the throat, chest, and belly. Breathe naturally and hold for 5 to 45 minutes. Benefits: Tonifies the Water Element in the body. Improves the function of the kidneys, bladder and sexual glands. Rejuvenates and stimulates the proper functioning of the endocrine system, which is intricately linked to the third eye and the pituitary and pineal glands. Fosters a sense of emotional safety and comfort around intimacy and sexuality. Description: Kuberamudra II is a single-hand gesture, originating in the Hindu tradition. Kuberamudra is used to invoke the energy of the Four Heavenly Kings in the Buddhist tradition and is commonly seen as a mudra for abundance and wealth. Technique: Join the tips of the index, middle and thumb fingers while curling the ring and little fingers into the palm. Application: In a comfortable seated position, form the mudra with each hand while resting the hands with palms up in your lap. Breathe naturally with a soft belly. Bring your focus to those things you would like to attract more of into your life. You can imagine the mudra as a magnet, helping attract and manifest your dreams and desires into reality. Practice for 5-45 minutes. Benefits: Balances the left and right nostrils and clears the frontal sinuses. Improves sense of smell, sharpens “inner vision” and the ability to see ones purpose and path in life. Helps to create abundance, especially if the desire to do so is virtuous and takes into account the beneficence of all beings. Description: Kurmamudra II is a joint-hand gesture. 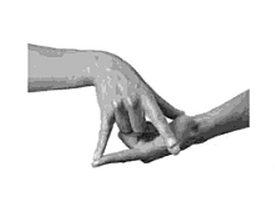 Ii originated in the yoga tradition and is part of the Gayatri Mudra series, which is one of 24 contained therein. 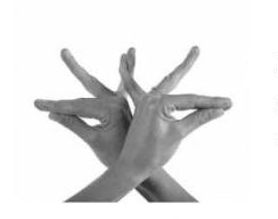 The mudra forms a triangular relationship between the water, air and fire elements and serves to powerfully harmonize the ojas (vitality), tejas (physical strength), and prana (life force). Technique: Turn the left palm up, folding the middle, ring, and little fingers into the palm. Extend the thumb and index finger. turn the right palm down, folding the middle and ring fingers into the palm. Extend the thumb, index, and little finger. Rest the right hand on the top left. Join the right index with the left thumb, and the right little finger with the left index. The right thumb rests against the base of the left thumb, near the wrist. Application: In a comfortable seated position, hold the mudra in front of your solar plexus (just below the sternum). Soften your belly, chest and shoulders. Settle into a relaxed stillness. Practice for 5-45 minutes. Benefits: Activates the self-healing power of the body, activates and balances the immune system (simultaneously reduces the negative effects of hypo- and hyper-immunity), assists in healing of all major diseases, especially cancer. Harmonizes the heart chakra and helps balances the relationship between the heart and the kidneys.